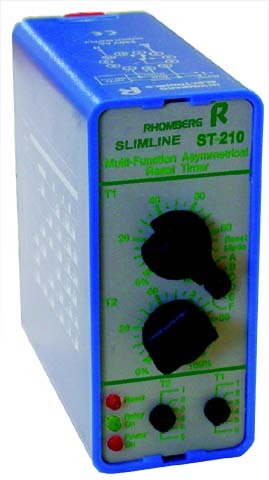 Rhomberg twin timers have separately programmable ON and OFF times, and cycle continuously between the relay being ON and OFF. Typical applications include control of freezing cycles in refrigeration plants, irrigation control, chemical dosing & mixing, periodic lubrication or water spraying. Programmable: Asymmetrical Recycling OFF cycle first, Asymmetrical Recycling ON cycle first. Programmable: 12 overlapping time ranges 0.2sec to 4 hrs. Separate OFF/ON time range selection. 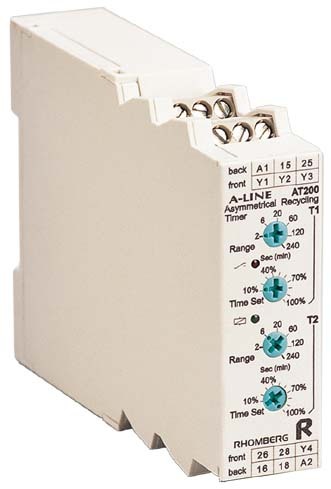 DPDT relay (5A per contact). Programmable overlapping time ranges 0.18 to 120 sec. Power ON, Relay ON & Reset LED's.